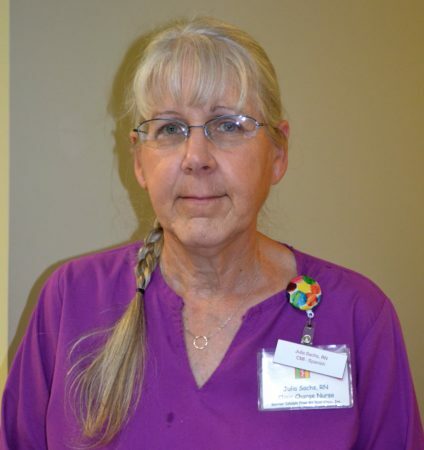 BIFMC Charge Nurse, Julia Sachs, who is currently one of the few clinically certified medical interpreters in the state of South Carolina, which requires ongoing testing. At Barrier Islands Free Medical Clinic, approximately 30% of patients are ‘Limited English Speakers’; primarily Spanish-speaking adults who live or work on Johns, James or Wadmalaw Islands. Many of the Spanish-speaking patients treated at the free clinic work in construction, landscaping, house cleaning, the food and beverage industry and hospitality; as well as those who are working in the area for a limited time as migrant farmworkers. Fortunately, the clinic is able to provide interpreting services for patients, including both in-person and telephone services as necessary. BIFMC Charge Nurse, Julia Sachs, is a certified medical interpreter who has gained trust among the robust Spanish-speaking population at the clinic. She is one of the only clinically certified interpreters in the state of South Carolina, a certification valid for 5 years, renewed only by completion of continuing education credits. To achieve certification, a candidate must demonstrate proof of being fluent in two languages; have completed at least 40 hours of medical interpreter training; and then must pass a two part certification exam, including questions on medical terminology, professional ethics, legal issues, and provider and patient management, as well as an oral exam. Sach’s ability to interpret between the patient and physician – as well as her compassion – has been an invaluable tool to expand BIFMC’s volunteer medical services to the diverse population of the islands. Now, with the expansion of the new 7 exam room medical clinic, Sachs hopes to continue to increase the Spanish-speaking patient population, attracting more adults from the local community without health insurance, by word of mouth – calling upon current patients and business owners within Charleston’s Latino community to help spread the word that medical care is available. You can help spread our mission to the local Latino community by sharing our “Espanol” information page.